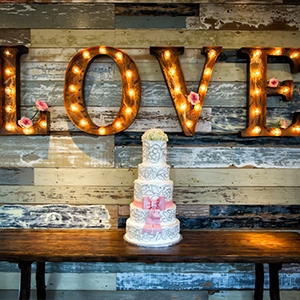 Lighting can convert any setting from normal to magical, and never is this more true than at a wedding. Here are 12 stunning ways that you can light up your wedding to create something truly special for your big day. 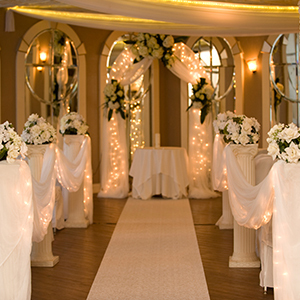 Use lights along the floor to guide your guests in the right direction when they arrive at the reception. This can be particularly effective – and useful – if your reception is outside, perhaps on the beach. A simple illuminated path will be a delightful feature for the guests as they arrive. 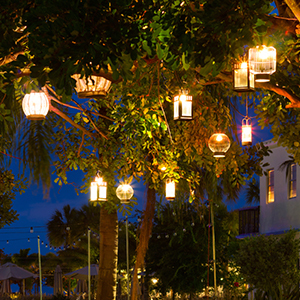 If there are trees near to the wedding or reception area, light them up by stringing some lights around the trunk or in the branches. This will add a truly magical feel to the proceedings. Create a whole wall of light by setting a wall apart and adding some lights to it that you can brighten and dim during the evening. 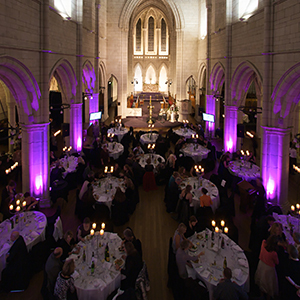 You could change the colour or the style of the lighting for key moments such as the cutting of the cake. 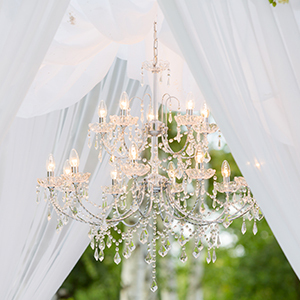 Chandeliers are an easy way to add some glamour, but they are usually used indoors. Change things up by adding some outside, which can be a great way to create a beautiful effect. 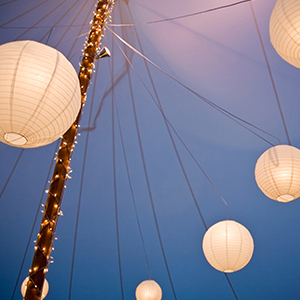 Lanterns are a wonderful way to add style and magic to any venue. 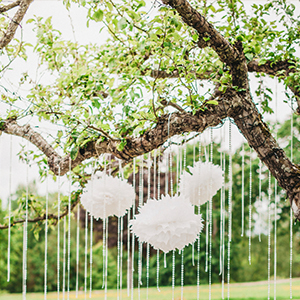 Hang old fashioned lanterns from trees or around the borders of the reception area to add some charm. 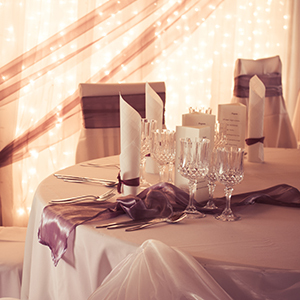 Fairy lights present you with many possibilities, and they are relatively cheap to use. Use them to create swirls of light around the trees or around other pillars, or create an entire canopy of them. Create an illuminated version of your names that you can hang up in the centre of the room or behind the main table, or use it as a backdrop for photos. 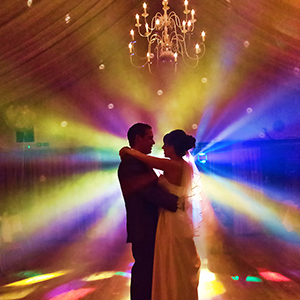 Don't be afraid to add lots of colour to your wedding in the form of lighting. Many people choose white lights, but coloured lights provide a wonderful contrast. 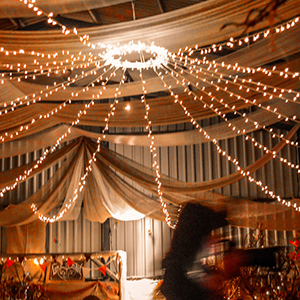 If you are holding the wedding or reception somewhere with wooden beams on the ceiling, make use of the opportunity to light them up with strings of bulbs to bring a glow to the room. 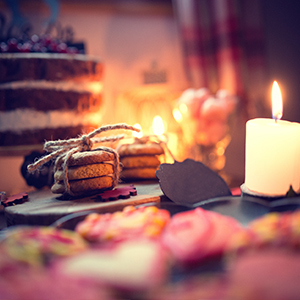 Light up your cake or the whole desert table, either with electric lights or candles, to make it more of a central feature in the room. Candles are the most romantic type of lighting. 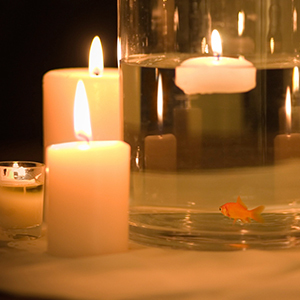 Float some candles in a fountain or in a purpose-made container to get the full effect from them. A traditional symbol of good fortune in the Far East, floating lanterns also provide a way to add some magic to the proceedings. Consider ending the night by releasing them into the sky and watching them float away on the breeze. So there you have it, you really can add a pinch of magic to your beautiful wedding day, with some cleverly positioned and spectacular ceiling lights, outdoor lights, wall lights, picture lights & even bathroom lights.